It is hard to explain what motivates people to do this crazy sport. Obviously one feels happy after finishing an Ironman, but apart from that rewarding feeling it also is a mental journey and an experience that stays with you forever. Anyone who participates in a long distance event will understand the feeling but it’s hard to describe it for those not competing. I’ll give it a go today. Even as a medical physiologist I’m reminded how many muscles you have that you’re normally not aware of. The days after the race, especially the second day, every muscle in your body is sore. Descending the stairs or getting out of a chair suddenly seems impossible. The adrenaline kick at the start is mind blowing. With the music pounding, the spectator’s arena heaving, and the palpable nervousness of all competitors, the start-line is a true psychological masterpiece. Even if you know how much suffering is to come, you happily and excitedly embrace the challenge. You couldn’t tell from the expression on my face in this shot taken 10s before the start, but I’m having a huge adrenaline kick here, it’s such a great feeling. The group of pro women was small at this race, and there were large differences in pace, so the field quickly got pulled apart after the start. Swimming isn’t my best discipline, and I couldn’t stay with the lead group, so after the leader’s first turn, I was no longer able to use them for navigation. With a 6:30 AM start time, the rising sun was scattering light rays all over the lake, making it challenging to see the buoys, and I definitely swam some extra yards. I don’t think I ever smiled so much leaving the water: there was total madness on the supporter-packed shore. 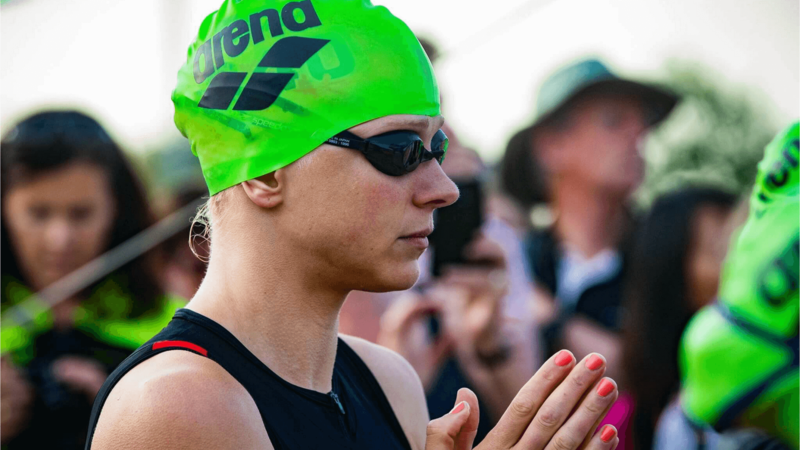 The transition is always a physically and mentally refreshing point in a triathlon: 1) Going fast here is a free reduction on your finishing time 2) It allows you to see your position in the field. The bike bags (where you keep your helmet etc.) still hanging on the racks indicated there were numerous pros behind me, making me feel better after the challenging swim, and 3) after a giving all you have for one sport means you will be happy to switch to a different discipline. The feeling of battling the hills and elements on traffic-free roads, focusing on pace, nutrition and just spinning your legs while staying in the aero position is amazing. Unfortunately, my bike legs didn’t show up for the race. My legs hurt after the first pedal stroke, and this was something I never felt before, and hopefully will never experience again. I finished the ride in 4hrs 59m, which isn’t bad, but not my best. It was tough going and took a lot out of me physically. I think my coach and I can learn from this: we can approach the taper period differently and I think I should start riding with a power meter to benchmark my output. But again, the audience and scenery made me smile many times. Although I love cycling, I couldn’t be more happy to switch to running, with a mind blowing tunnel of supporters for the first miles. If you want to go as fast as you possibly can, you have to push your body to its limits. Continuously monitoring your physical state is extremely important during the entire race but especially in the marathon. Weather can be a complicating factor. When you are accustomed to training in rainy and cold London, having tropical temperatures on race day has a massive impact on your body. As it was 33C (91 F), I knew it would be essential to keep cooling myself, focusing on hydration, and compensating for the loss of electrolytes, especially during the marathon. Perhaps more importantly, is adjusting your pace to deal with the heat. As your blood vessels towards the surface of your skin open to dissipate the heat, less oxygen is delivered to your muscles, so taking it a bit easier can really prevent you from collapsing. Although I had been out for about 6hrs, the real race starts at the marathon. It is physically and mentally grueling, and usually the most challenging for all competitors. While I was careful with my nutrition and hydration, I went wrong with my pace. I was on schedule for a 3.23-3.25 marathon, but I was laboring from the beginning and just didn’t feel comfortable. At 36k I almost suffered from heatstroke-a feeling I recalled from my race at Kona-and I started feeling really dizzy, and was forced to start walking. "The walk of shame" is the ultimate humiliation for a triathlete. It is a smash in the face, and really crushes your mind, body, and spirit and makes you feel so bad about yourself. After a 4k sunny afternoon ‘stroll’, which on a positive note allowed me to chat with my family who traveled all the way to watch, I had dissipated enough heat and was able to run again. In the end, I finished OK, getting my PB for an Ironman, but I lost many spots in the pro rankings. FitnessGenes made a huge difference in my life by allowing me to work flexible hours and take time off when I needed to either maximize my training volume or just get some rest. I’m super grateful for the company’s support! Is gene doping the future of cheating? Could endurance athletes benefit from a ketogenic diet? Are you genetically more like your mother or your father?